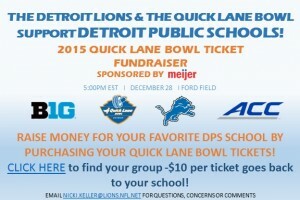 The Detroit Lions and sponsors of the Quick Lane Bowl are offering a fundraising opportunity for supporters of Detroit Public School League athletics. Fans can raise money for their favorite PSL team by purchasing Quick Lake Bowl tickets. Click here to find your group: http://www.detroitlions.com/quick-lane-bowl/find-your-group.html. Participating PSL schools include: Central, Cody, DCP-Northwestern, Douglass, Denby, DIA, King, Osborn, Pershing, Renaissance, Southeastern and Western. For every ticket sold in your group, $10 goes back to support your school’s program. The 2015 Quick Lane Bowl, featuring the best possible matchup between teams from the Big Ten and ACC, will be played at Ford Field on Monday, December 28 at 5 p.m. ET and will be televised by ESPN2. Rutgers beat North Carolina 40-21 in last year’s inaugural event. Go online. http://www.detroitlions.com/quick-lane-bowl/find-your-group.html. 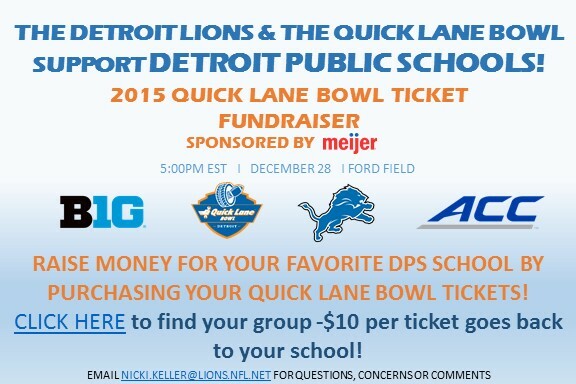 Purchase your Quick Lane Bowl ticket today and support your favorite PSL athletic program.